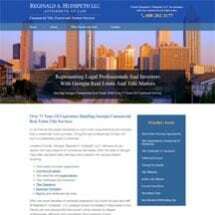 Located in Duluth, Reginald A. Hudspeth LLC, Attorneys at Law, represent attorneys, their agents as well as investors with various matters relating to commercial real estate within the state of Georgia. The attorneys possess over 75 years of combined legal experience and have handled many projects for people located throughout Georgia as well as those located outside of the state, including California, Arizona and Florida, who have needed experienced local knowledge of Georgia commercial real estate law. The law firm often handles real estate purchase agreements, title searches and examinations for both commercial and residential projects, title insurance, and escrow and settlement services. They also assist with many aspects of the closing process, including document review and fund disbursement. The experienced lawyers at Reginald A. Hudspeth LLC, along with a staff who possesses unique knowledge in this area of law, provide professional customized representation and tailored solutions to each project.